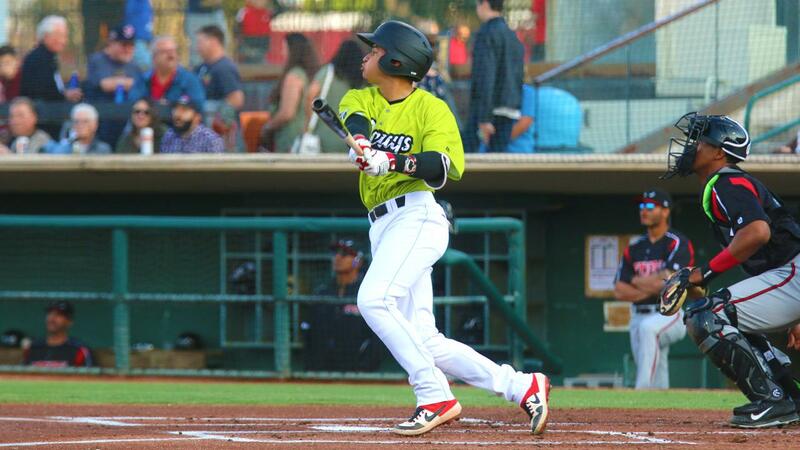 SAN BERNARDINO, CA- The Inland Empire 66ers of San Bernardino (playing as its alter ego, Los Cucuys de San Bernardino) earned win number one of the 2019 season with an 8-2 decision over the visiting Lake Elsinore Storm (2-1). The 66ers got strong pitching and took advantage of four Lake Elsinore errors, three alone in a six-run sixth inning, to position themselves for a series split in the finale on Sunday afternoon. The 66ers (1-2) took a lead in the second when with runners at first and third Kyle Survance Jr.'s ground ball brought in a run and was mishandled allowing Survance to reach. Later in the frame Alvaro Rubalcaba's RBI single to right made it a 2-0 lead against Storm starter Mason Thompson, who allowed no more runs and fanned seven over four frames in a no-decision. Sixers starter Chris Rodriguez pitched into the third inning in his first official appearance since 2017. He was relieved by Erik Manoah who the Storm touched for two runs in the fourth to tie the game. The Sixers got the big inning in the sixth however against reliever Dylan Coleman (0-1) in a frame that opened with a walk to David MacKinnon. Torii Hunter Jr. then lifted a ball to right that Storm outfielder Tirso Ornelas misplayed for a two-base error. Kevin Williams Jr.'s RBI infield hit gave the Sixers a 3-2 lead. After Survance walked to load the bases, IE catcher Ryan Scott lashed a single to left scoring Hunter; Storm LF Taylor Kohlwey kicked the ball allowing Williams to score from second and Survance to fly home all the way from first to make it 6-2. The inning continued when Sixers' SS Leanardo Rivas ripped a RBI single to center and advanced to second on a fielding error by Storm CF Jeisson Rosario. Rivas then scored on Orland Martinez' double off the wall in right to cap the scoring at 8-2. Andrew Wantz (1-0) was stellar out of the pen for Inland Empire as he tossed four shutout frames surrendering three hits without a walk and fanned four in his Cal League debut. The series concludes Sunday at 2:05 pm. The contest can be heard and seen live at 66ers.com.